(Bloomberg) -- A landmark Cold War-era weapons treaty between the U.S. and Russia is on the verge of collapse. The U.S. said it was pulling out of the Intermediate-Range Nuclear Forces treaty, and the Kremlin quickly followed suit. The 1987 agreement banned an entire category of weapons: ground-launched intermediate-range missiles deployed in Europe. Washington says Russia has violated the treaty, a charge Moscow denies and turns back on the U.S. The Trump administration says it will formalize the U.S. withdrawal this summer if Russia doesn’t come back into compliance. That could revive the nuclear arms race in Europe and spur one in Asia. 1. What is the INF treaty? 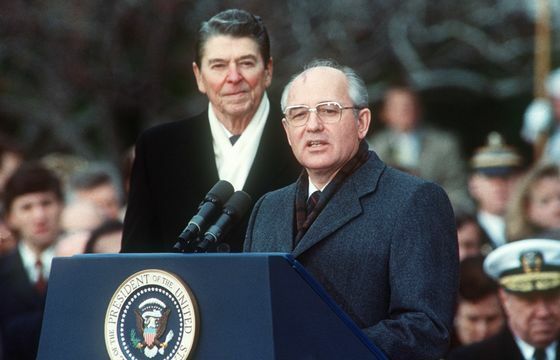 Signed by U.S. President Ronald Reagan and Soviet leader Mikhail Gorbachev, it was a high point for superpower arms-control efforts. It had been preceded by a spiraling arms race: In response to Soviet deployments in the late 1970s of SS-20 intermediate-range nuclear missiles that could strike Western Europe, the U.S. put missiles of its own in West Germany, Italy and the U.K. After years of talks on limiting the weapons, Reagan and Gorbachev reached agreement to eliminate them entirely. 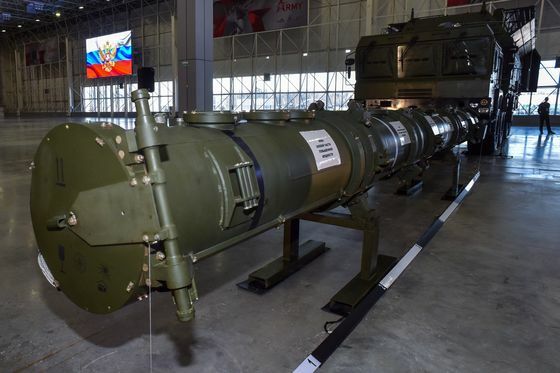 The INF treaty, which has no expiration date, called for both sides to destroy and never deploy again ground-based ballistic and cruise missiles with a range of 500-5,500 kilometers (300-3,500 miles), either nuclear or conventional. The pact allows similar weapons fired from ships or aircraft. A total of 2,692 missiles were destroyed under the treaty in the first three years, according to the U.S. State Department. 2. Why has the U.S. suspended its obligations? The U.S. alleged in 2014 that Russia had tested a weapon, the 9M729 ground-launched cruise missile, at a range that fell under the treaty. In 2017, the U.S. said Russia had deployed that weapon. Then in October 2018, NATO declared that Russia was in violation of the treaty. U.S. Secretary of State Michael Pompeo said the U.S. was giving Russia until February 2019 to get back in compliance. Trump’s national security adviser John Bolton has called the INF treaty outdated and said it doesn’t address the rising threat from China, which isn’t bound by the accord. 3. What does Russia say? It has called on the U.S. to provide proof. It says the relevant missile was never tested at distances banned under the agreement, and also has accused the U.S. of breaching the treaty with its own missile-defense systems in Europe, a charge Washington rejects. 4. What would happen without the treaty? 5. How have other countries responded? 6. Could diplomacy still save the pact? The U.S. and Russia have had several rounds of discussions since at least 2014 without progress. Trump has said he would consider a new pact that included China, but officials there have shown no desire to join a treaty that would ban a large part of their nuclear arsenal. 7. Are other major arms-control deals under threat? If the U.S. pulls out of the INF treaty, the only remaining pact regulating the world’s two biggest nuclear arsenals would be an agreement that expires in 2021. New START, signed in 2010 by then-Presidents Barack Obama and Dmitry Medvedev, sets overall limits on nuclear weapons for each side. The treaty can be extended for five years if both sides agree. No talks have begun on prolonging the deal. A related QuickTake on nuclear proliferation. U.S. State Department fact sheet on the INF treaty. The U.S. Congressional Research Service on alleged Russian violations.